The best desktop vaporizer will more than likely be different for every person. Not only do they vary quite a bit more than your average portable vaporizer but they tend to cost a lot more as well. 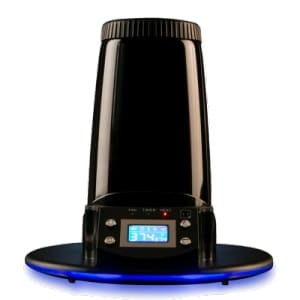 This article will list my top dry herb and concentrate desktop vaporizers. You might be wondering what is the difference between a portable vs desktop vaporizer, and which one is best for you. In most cases, the desktops are going to be larger, more powerful, more reliable, and while a lot of portable vapes utilize conduction or hybrid heating methods, almost all desktops are full convection. Since they are not constrained by size, shape, weight, or battery life you can generally expect better flavor, denser vapor, and better efficiency from a desktop compared to a portable. If you think a smaller and more portable vaporizer is best for you, or you just don’t want to be limited by a power chord check out my best portable vaporizers for 2019 article. To help you find the best desktop vape, I’ve broken down all of the top dry herb desktop vaporizers and placed my favorites into different categories. These categories are based on three different delivery methods; Bags, Whip and Direct Draw. For each category, I will recommend my top pick and a budget pick. I will talk briefly about the vaporizer, provide a link to my full review, and a recommended authorized retailer to buy from. Click on the preferred category to go to that section or click on the Shop link to check out the best price from one of my recommended authorized retailers. Feel free to leave a comment below with any questions about my top picks for best desktop vaporizers. Bag vaporizers are quite a unique experience. The vaporizer will fill the bag with vapor, and then you will casually take draws from the bag. Bags are best if you are looking for a vape for group use, and they are really convenient and easy since you are free to move and walk around with the bag. The Volcano is my dry herb vaporizer daily driver and has been for about seven years now. It gets turned on from the time I wake up until the time I go to bed and the Volcano delivers consistent, quality results every time. First off, the Volcano comes in two different versions. The Digit Volcano is the digital version offering on vape temp display, easy to press temp buttons and a 30-minute auto-shutoff timer. The Classic Volcano is essentially the exact same vaporizer minus the digital temperature display and auto shut-off feature. The temperature on the Classic is controlled via a rotary dial ranging from temp one to nine, nine being the highest. The system itself is pretty simple. It uses a heater with a fan that sits below the chamber. Place the chamber on the top of the unit and it blows hot air over your herbs into a bag. You then detach the bag from the valve system and press your lips against the mouthpiece to take a draw. The next decision would be whether to go with the Solid Valve or Easy Valve system. Basically, the Solid Valve is a more permanent solution where you buy a spool of bags and cut them to your preferred size. The Solid Valve is the better option for single users because it allows you to shrink the chamber size with the chamber insert. The downside to the Solid Valve bowl and chamber insert require a lot more cleaning than the easy valve bowl. The Easy Valve system is exactly as it sounds. You just buy new bags that are pre-made with custom mouthpieces. All the sizes are the same and there’s very little cleaning involved. You also don’t have to make any bags, but if you really want the custom bag sizes you can pick up the $11 easy valve balloon adapter to add the function. At first, I really liked the Solid Valve system because it allowed me to customize the bag sizes which was nice but over time I’ve become lazy. The lack of cleaning involved with the Easy Valve is just too hard to pass up and I’ve been using the Easy Valve system most of the time lately. In the end, I really like both valve systems, and while they do each have their own strengths there’s no wrong choice. It is completely up to you. One under-rated aspect about the Volcano is the lack of cleaning. With the Solid Valve set as long as you quickly brush the chamber/plunger in-between bowls you can likely vape over an ounce of material before needing a cleaning, this is quite a bit more than most other vaporizers, and with the easy valve set you can easily go 4-8 ounces before needing to clean the bowl. I have the Cloud Evo, the Herbalizer, the extreme q, da budda, e-nano, plenty, and I’ve tried countless others. I ALWAYS come back to the Volcano. It’s stupid easy to use, always ready to go and reliable. I can always count on it to work and work well. It’s also one of the best options for groups because the bag can easily be tossed around the room. 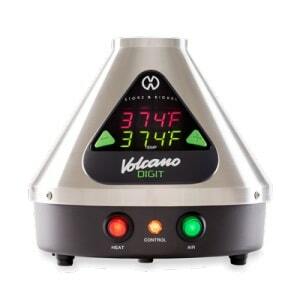 Click Volcano Review below to check out my full review or Shop Volcano to pick one up from my recommended authorized retailer. 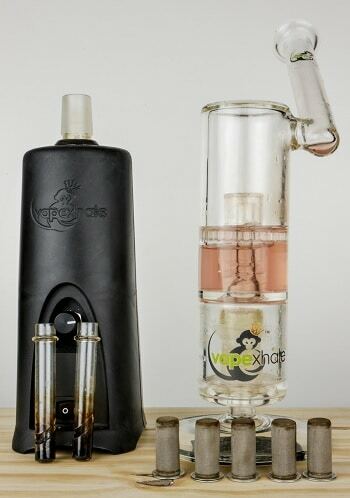 The Extreme-Q vaporizer is a multi-use desktop vaporizer that features the option to fill a bag or use a whip. I like to call the Extreme-Q the jack of all trades but master of none. Yes, it offers both the bag and whip but it’s not the best in either category. Compared to the Volcano the bags fill much slower, they will not taste quite as good, and the volcano bag valve systems are great, they seal the vapor and have essentially zero draw resistance. With the Extreme-Q bag, you will have to keep your finger over the tube to prevent leakage, and the tube has a thin diameter so you can take the huge free-flowing draws like you can with the Volcano. Generally, I prefer the bag delivery method. It’s easy to pass around and I’m not tied down to a whip in one location. But when I use the Extreme Q I actually find myself using it with the whip most often. So if you like the whip option and are also interested in a few bags here and there, I really think you would like the Extreme-Q. Overall the Extreme-Q is actually the desktop vaporizer I use the least from this page, but it is also the cheapest vaporizer. Since the Extreme-Q is very reliable and very versatile it definitely deserves its spot here. 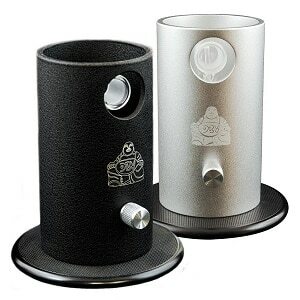 Direct draw vaporizers give the closest experience to a steamroller or a bong. These units are best for flavor, efficiency, and vapor density. These units are on-demand so you will generally take a few draws at most to finish each bowl. If you are looking to get maximum effect from a set volume of herb, you should consider a direct draw unit. The CloudEVO vaporizer has an all glass vapor path and uses herb baskets for dry herb or glass/quartz “vapexnails” for your dabs/concentrates. Turn the unit on and select the temp via a rotary dial. There are no numbers on the dial but it’s set up like a clock. 9:00 would be your lowest temps while 3:00 higher temps. Place the nail or basket into the top, place your glass hydratube or regular mouthpiece over the basket and rip it. The glass bubblers/bongs are called hydratubes and they definitely make the entire session more enjoyable. You can use the bent glass mouthpiece that comes with the unit but I’ve noticed that the vapor tends to get pretty warm with longer rips. I recommend getting a Hydratube with a small amount of diffusion. You really only need the diffusion for combustion. I like the taste of vaporization and especially enjoy it from the Cloud EVO. There’s really not much else out there that will get you this type of pure taste/quality. Downsides are that the baskets don’t hold up too well under heavy use so you’ll have to replace those. I also recommend that you pick up the Quartz version of the vapexnails. They will be much easier to clean. 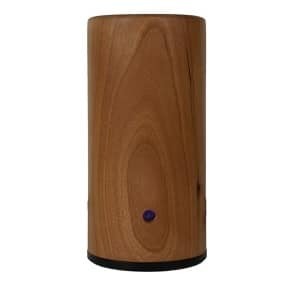 The E-Nano is like a smaller wooden version of the Cloud EVO. Each vape is hand crafted in the USA out of sustainable hardwood, and efficiency along with pure taste is the name of the game with this unit. This is currently the smallest desktop vaporizer I have, and when the glass stem is not in place it’s also probably the most discreet unit. You are going to be loading very small bowls with this vape generally in the size of .025-.1g area so this one is amazing if you want to conserve. Despite the low price and small bowl size the E-nano still rips hard. You can easily blow out big dense clouds since it can finish a bowl in 1-2 draws. The E-nano heats up in a few minutes and has fully adjustable temperature control with a dial going from 1-11 corresponding to 0-560F. I personally like to vape in the 5.5-7.5 range with dry herbs. In the stock configuration you will draw from a glass stem, however, you can also add an optional glass water pipe adapter if you like to vape through some glass. Whip vaporizers provide the best casual session experience. If you want to pack a bowl and enjoy it over a longer period of time with more draws you should consider a whip vape. With a whip vape, you can expect great flavor and very smooth cool vapor. Whip vapes are the desktop vaporizers least likely to make me personally cough. The Da Buddha is made in Colorado, and while it has been around for a long time but it is still relevant because it is reliable, reasonably price, and produces tasty, smooth, and cool vapor. There are some cheaper whip vapes options out there, but this one really stands out with the best value. The DBV uses a ceramic heating element and an unmarked dial to control the temperature, and while this unit does require a bit more practice than the rest of the vaporizers on this list to get the best results it is still pretty easy. I generally like to vape with the dial between 12 o’clock and 2 o’clock using the DBV. With this vaporizer your draw speed is important, if you draw too fast it will under-cook the herb for a set temperature, and if you draw too slowly it will overcook the herb, so you will want to find the right temperature setting for your preferred draw speed. 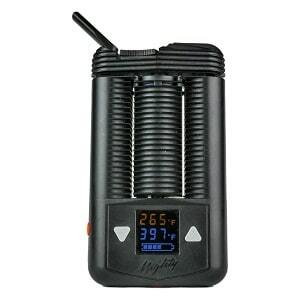 The Mighty vaporizer is definitely a portable vaporizer but I find myself using it at home more than on the go. The Mighty has exceptional battery life and can be used while charging so it works perfect for both on the go and carrying from room to room or out onto the deck or yard. I also like the fact that it’s one of the easiest vaporizers to use and own. The cleaning is infrequent, but it does take a while when needed. I’ve gone months before cleaning my Crafty/Mighty vaporizers. The other thing that I like about the Mighty is that it’s just the right size to pass around in a group setting and its durable enough to survive big drops. So the Mighty isn’t a desktop vaporizer but hopefully, you can see where it might serve that purpose. It also hooks up to glass pieces via a water pipe adapter and is powerful enough to draw huge clouds. 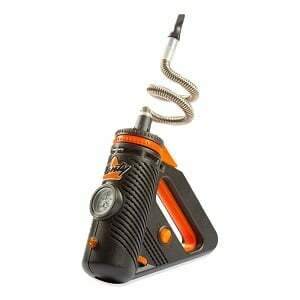 The Plenty is a hand-held home-use vaporizer made by Storz and Bickel. They are the same manufactures of the Volcano, Crafty, and Mighty. The Plenty is one of the most enjoyable session vaporizers that you can buy BUT it is a bit of an herb-hog. It definitely works best with a full chamber or at least a smaller layer along the bottom and it will go through it fast. The Plenty plugs into the wall and is meant to be held in your hand for the duration of the session. There’s really no way to set it down which is a good thing because then you’d just be wasting more herb. The Plenty will definitely not be for the small load size efficient type BUT if you have access to a lot of dry herb than you’ll really love the smooth, taste, cool vapor quality of the Plenty. 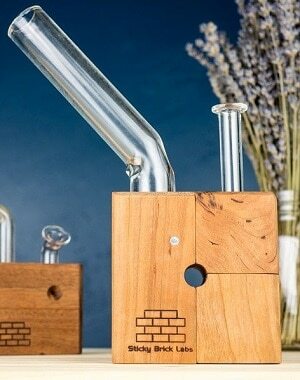 The OG Sticky Brick is a butane home-use vaporizer. It’s too big to fit in your pocket but it’s the perfect size to fit in your hand and carry from room to room. The Original Sticky Brick is made out of natural hardwood in the USA by Sticky Brick Labs. The name basically explains what they are. They are bricks that stick together via magnets to create a wonderfully smooth, cool, and tasty session. The OG Sticky Brick is the one I recommend for first-time butane users because it’s the easiest to use straight out of the gate. They also offer the Junior which is smaller more pocketable version. The Hydrobrick which is for someone that already has some glass at home and lastly the HydroBrick MAXX. The MAXX includes the glass mouthpiece, glass WPA, whip, and connector. Be sure to pick up a quality butane torch. If you pick one up through the link below, you’ll get an Eagle torch which is the same one I’m using and it’s good to go. I sure like your reviews, thanks very much for them! I wanted to ask for your thoughts on the best vape for me. : I have used medical cannabis for quite a while via home made tinctures but have been considering trying vaping. I am a single user, would be using at home only, am not concerned about the price. My main objective would be to get the product that would likely be the best for my lungs/respiratory. I haven’t seen much written about that though so again I would really appreciate your thoughts on that question/objective. Oh, and also I would prefer to vape dry herb only unless you feel like the vape liquids are more “healthy” and easier on respiratory? If you wanted a desktop model, I would recommend the VapeXHale Cloud EVO or the E-Nano. Both are very clean hits and I prefer to use them both with water. It cools down the vapor and makes it easier to draw. Portable, Firefly 2! Pure convection heating and arguably the best tasting portable vaporizer on the market. Did you have a budget you were trying to stick to? Let me know if you have any more questions! I don’t want a vaporizer for cannabis. I need one for lactuca virosa extract that isn’t a crack pipe in a Sunday dress. what do you suggest? I liked your your reviews and think you can help me find the product I need. A desktop would be best. I’m not 100% on this but I feel like the E-Nano or the Extreme-Q might be good options. I have a review for the Extreme-Q and check out my best desktop vaporizer article for info on the E-Nano and some others. Hey, what would you say is the most durable desktop vaporizer? My hubby vapes for pain multiple times a day and sometimes has trouble handling the glass bowl and whip connector on his Extreme Q. He needs something that can draw fast and intense to move on with his day, and with minimal messing around with small glass pieces. Thanks! The Volcano is the most reliable vaporizer in my opinion. I personally use my Volcano more than any of my other vaporizers, and it’s also one of my oldest vapes (I got it back in 2009) and it’s still running like a champ. The Volcano bags also have MUCH higher airflow than the Extreme Q bags he might be used to, so the bags fill up much quicker, and you can also draw quicker. The Extreme Q bag feels a bit like taking a draw through a very thin straw with slower airflow, with the Volcano bag you can fill you lungs immediately. Thanks for this write up! i am going to get the volcano analog and my buddy is getting the crafty! thanks for the 15% off too! My pleasure! I use the Volcano daily. It’s literally turned on from the time I wake up to the time I go to sleep and sometimes it’s just on 24/7 lol. It’s been going strong for years now. Enjoy! Let me know what you think when you get them! When you fill the bag on the volcano, how long does it last in the bag? Do you have to use it right away or can you use it later, like an hour or so later? Will’it still be potent?